Department of Environmental Conservation officials deliver Steelhead from the Altmar Hatchery this afternoon at the Oak Orchard River. 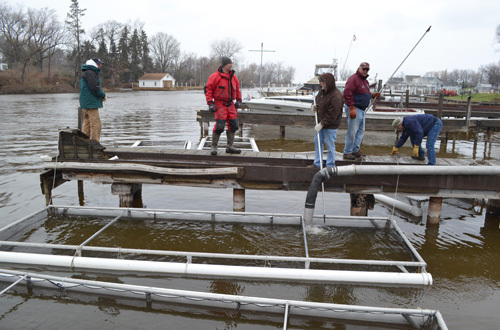 The fish will spend the next month in pens by Ernst’s Lake Breeze Marina. POINT BREEZE – Charter boat captains and other Point Breeze stakeholders welcomed more than 100,000 fish today that will be nurtured in pens for the next month or so. The tiny Chinook salmon and steelhead will be released about twice their current size. That will increase their chances of surviving in Lake Ontario and its tributaries. The fish, while they grow in the pens, also will imprint on the river. When they are mature and ready to spawn, they are more likely to return to the Oak Orchard to lay their eggs. The Point Breeze community started the pen-rearing project in 1998. Bob Songin, charter boat captain with Reel Excitement, has been leader of the project each year. Volunteers are up at 5 a.m. each morning to feed the fish, which are fed five times a day. Songin said the project has resulted in more mature fish that return to the Oak Orchard and also in Lake Ontario near Point Breeze. “We have double the survival rate, which means we have more fish to catch,” he said. 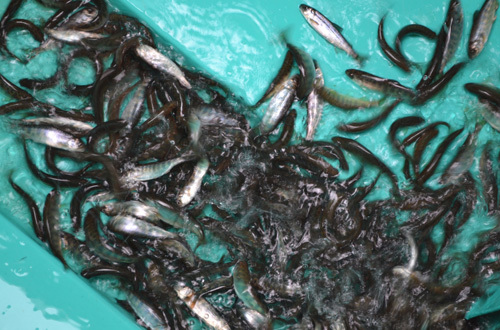 The Department of Environmental Conservation brought truckloads of fish from the Altmar Hatchery. The agency stocked 106,000 Chinook in the pens, and 14,000 Steelhead or Rainbow Trout for the pens. 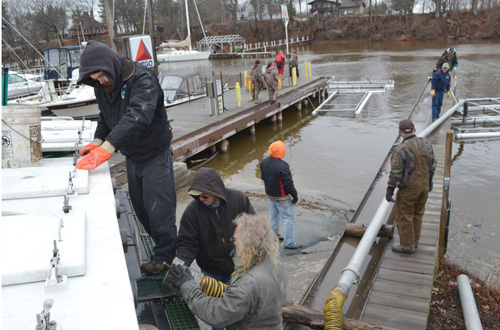 The DEC also stocked 7,000 Steelhead in the Oak Orchard River by the Twin Bridges near Narby’s. 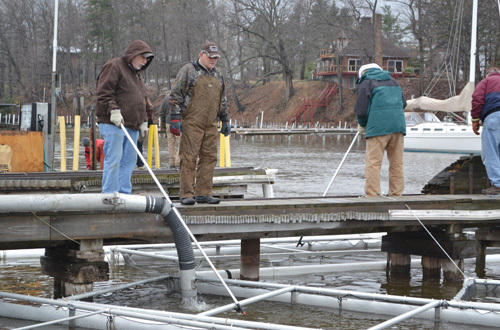 Volunteers are welcome to sign up at Ernst’s Lake Breeze Marina for a chance to feed the fish. The DEC provides the food for the fish. The Steelhead are six months old and about 3 or 4 inches long. They will nearly double in size in the next month in the pens. Mike Waterhouse, the Orleans County sportsfishing promotion coordinator, helps with the fish stocking in one of the pens. Bob Songin, in red, leads the pen-rearing project. About 20 volunteers assist with the effort each year. The pens will keep the fish safe from predators while the Steelhead and Chinook grow in the next month. 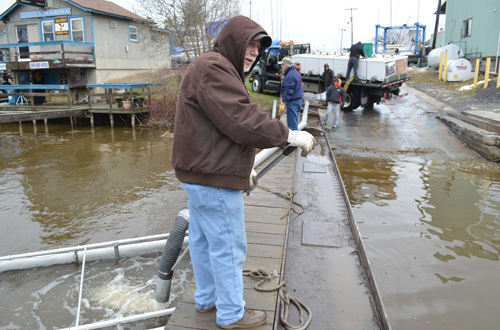 Medina Journal-Register — POINT BREEZE — It was a bit later than normal, but workers at the former Lake Breeze Marina were spotted launching boats last week. “We normally have the boats in by mid-March, but it was a late spring this year,” said Doug Bennett. Bennett recently sold Lake Breeze Marina to one of his long-time employees, Gatlen Ernst. The new owner said he is hoping customers experience a seamless transition with the change. 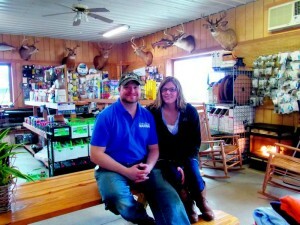 “I’ve been here 10 years and have developed some pretty good customer relationships already,” Ernst said. “Plus most of the faces are the same.” The only changes in staff at the newly named Ernst’s Lake Breeze Marina are an additional mechanic and Ernst’s fiance Danielle Daniels, who will help more on the administrative side of things. Daniels’ family owned Dale’s Market in Albion for a number of years. Ernst said the new venture has brought a newfound sense of excitement to the upcoming boating and fishing season. “I’m a little nervous, too, because this is a big step for me,” he admitted. Still, the marina is located in 2013’s Ultimate Fishing Town, as named by the World Fishing Network. As a first-time business owner, Ernst took a moment to recall starting at the marina 10 years ago. Ernst’s degree from Nazareth College is in business administration, with a concentration in entrepreneurship and marketing. A few years into his full-time employment at the marina, he said he spoke with Bennett about his growing interest in the business. Medina Journal-Register — Citing a strong working relationship with the Bennetts, Doug and his wife Jan, the marina changed ownership in time for this season. In the wake of that change, Bennett said he remembered a time when the land used by the marina was his family farm’s heifer patch. The barns are a major necessity for the marina as they protect customers’ boats from the harsh Western New York winters. “A lot of boat owners are probably more fussy about their boats than their cars, because for them their boat is the second largest investment they’ll make,” Bennett explained. 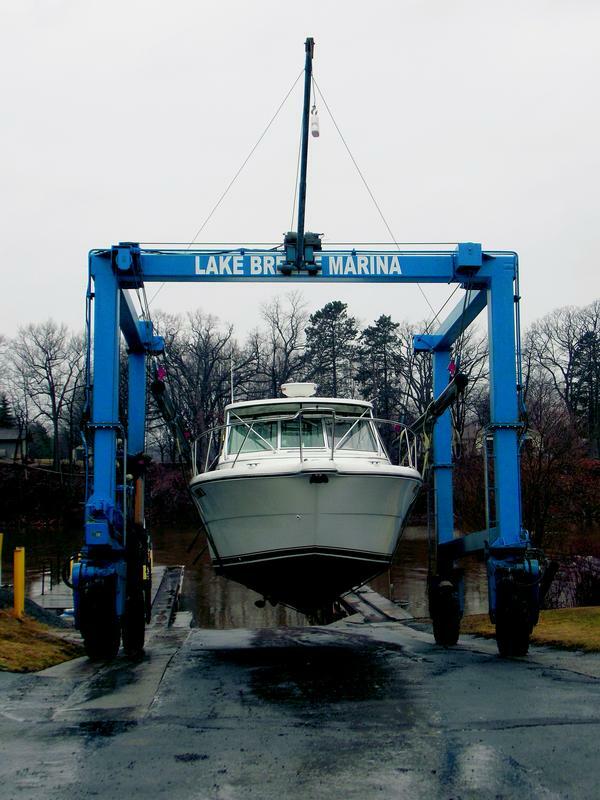 Among the services offered at the marina are boat storage, routine mechanical work like an oil change, cleaning and scrubbing of hulls, waxing of hulls, and full detailing. “It all depends on what people want,” said Bennett. As for the cleaning, he noted that most of the boats are stored indoors and when they come out in the spring they are normally in good shape. Ernst noted that the marina is operating at capacity, with about 120 boats.